A fully deregulated market brings added levels of complexity for vendors and utilities. 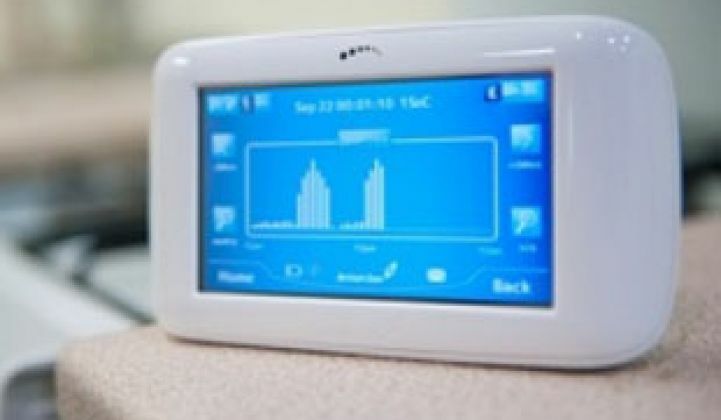 Photo Credit: In-home displays will accompany smart meters. The United Kingdom’s ambitious smart meter plans have fallen behind schedule before the schedule even began. Plans to install about 47 million smart gas and electric meters have been delayed from 2014 to the fall of 2015. The end date has been pushed from 2019 to 2020. The questions that still need to be answered are not insignificant, such as the technical specifications, building a communications network and the need for a new regulatory framework. It doesn’t help that the request-for-proposal process is “awash with complexity,” according to David Groarke, senior smart grid analyst at GTM Research. There should be some praise that the agencies involved are choosing to take a thoughtful approach, rather than starting the program and then facing problems and, potentially, significant customer backlash. The roadmap, however, has been outlined for years. Interoperability is going to be a major challenge in the U.K., where consumers can change their energy retailer on a whim. That means all of the equipment, communications and software that each utility chooses has to work with any other system that another utility might install. On the communications side, the government is taking bids for a national smart grid communications platform, which has not been awarded yet. The bid will likely go to a large telecom with other industry partners. Greentech Media recently spoke to Rob Conant of U.S.-based AMI company Trilliant, which is working with British Gas, about some of the challenges. “It’s a much more complex deployment than we’ve seen in the U.S., because you have to support this change of supplier function,” he said. In the U.S., many utilities have been promised interoperability when choosing vendors, only to find that integrating various platforms or communications networks is far more complicated in the field. The deregulated market only magnifies the situation across the pond. Some utilities are already rolling out meters, such as British Gas, which has about a half a million meters deployed. There are expected to be about 2 million meters deployed in the U.K. over the next two years, according to The Guardian. Although the delay is a blow to metering and communications companies hungry for a piece of the action, the decision was generally praised by consumer advocates in the U.K., who are enthusiastic about some of the benefits in terms of allowing customers to manage their energy use, but wary of missteps that could fuel consumer anger. Unlike most parts of the U.S., however, the retailers have a large stake in getting it right the first time with customers -- lest angry customers simply take their business elsewhere.